The Round of 16 of the 2018 FIFA World Cup begins today and we have some top-tier matches to kick off the knockout stages. Four powerhouses take center stage Saturday and there will be stars all over the pitch. We have a good ol’ slug out between Uruguay and Portugal on the tail end of the doubleheader, but before that Messi and Argentina meet one of the more complete teams in the tournament in France. It’s arguably the best day in the Round of 16. Get ready. On paper, this might seem like a close match-up but we might get a completely different result on the pitch. Neither squad has been overly convincing; one of the teams is in shambles right now while the other is still trying to find their identity. It’s one of the best players in the world versus one of the more talented teams in the world. France qualified at the top of Group C and it was relatively easy 7 points, winning their first two games against Australia and Peru before a scoreless draw against Denmark, arguably the most boring match of the tournament. But wasn’t a dominant French performance overall. They struggled to find goals on Austrailia and it took two wonderful moments from Paul Pogba to generate goals. In the Peru match, they got a deflection which got behind the Peruvian goalkeeper and right to the feet of Kylian Mbappe. France was the stronger side in each game, but you didn’t walk away from those matches thinking they put on a grand show. Like Brazil, France are not expected to just win. It’s especially evident with all of the young talent they boast at every position. It’s also troubling to see the French attack only score three goals in the group stage. With the likes of Mbappe, Griezmann, and Dembele up top, France has looked mediocre and have failed to score more than one goal in open play so far. Argentina had a much more difficult time making the knockout rounds. 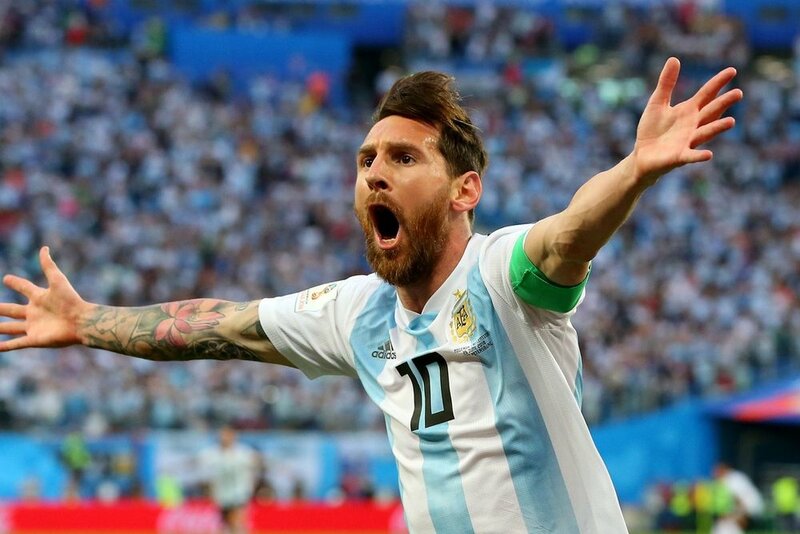 In the group of death, Argentina was put through the ringer but somehow escaped. After a disappointing draw against Iceland, Leo Messi and company were thrashed by Croatia 3-0, a result both sides deserved. Argentina was outclassed and Messi was nowhere to be seen in the second half. Behind Luka Modric, Croatia bossed the game and won deservedly. Needing a win against Nigeria, an early Messi goal gave them the spark they needed, but it was canceled out by a dumb penalty by Javier Mascherano, which allowed Nigeria to equalize. When all hope seems lost, Marcos Rojo volleyed home a shot in the box to give them the lead and send Argentina to the round of 16. They finished second in Group D, which was a result few saw coming. They weren’t one of the best teams to make it to the Round of 16 and the group stage was just pure chaos. Argentina got lucky in order to advance and they will need more of it against France. France’s offense has been lackluster so far but Argentina’s defense is very shaky. Mascherano has looked his age and the centerbacks are thrown into the fire every time an opposing team gets the ball. If there was a game where France will want to see their attack get revved up, it’s this one. The formula is simple for the underdogs, everything will have to funnel through Messi and Ever Banega. Those two are the players for Argentina that are going to create things for others. It was the duo who combined for their first goal against Nigeria with Banega sending a beautiful ball over the top. With France’s defense centered on stopping Messi, it will likely take a world-class performance from Banega to unlock them. N’Golo Kante and company are going to make life tough for one of the best players in the world and these are one of those cases where team trumps talent. Messi can’t do it all for Argentina and despite the talent he has around him attacking-wise, it won’t make up for the rest of the field and how good France are. Kante is a one-man destroyer in the midfield and if Messi is kept in check, it will likely be because of him. With Pogba and Blaise Matuidi bossing the midfield, France will control the game and force Argentina to hunker down and play on the break. Argentina can counter attack, but the question is how long can they keep France from smashing the ball into the back of the net? My guess is not long. Prediction: France are the better side and although Messi will likely produce a wonder goal against them, they will be too much for the Argentine defense to handle. If the first game will be attack-minded, this one will be the exact opposite. This game will be an absolute war between two sides who aren’t afraid of making a game mucky and terrible to watch. Both Portugal and Uruguay are content to sit back, defend, and let the talisman up top do their work. There will be a lot of hard tackles and we might even get some tension in this game. This will be good. Uruguay, as everyone expected, finished first in Group A with nine points. But like France, they weren't as dominating as they could have been, with the exception of the second half against Russia. It took a Gimenez header in the 90th minute to beat Egypt and a Luis Suarez goal off a corner to beat Saudi Arabia. The floodgates opened up in the final game against Russia, but it was thanks to the host nation’s own doing. An own goal and a red card practically sealed Russia’s fate, but it did give Uruguay a boost heading into the knockouts. It also gave Edison Cavani a goal which might help his confidence in this game against Portugal. They have looked sturdy in defense but the midfield still needs to answer some questions. Youngster Lucas Torreira has looked like a solid player in the midfield and is the only one who can play as the link between the back line and the duo of Suarez/Cavani. What Uruguay has missed for so long is a player who can do it all in the midfield and Torreira has shown some potential to do that. But it seems unlikely he will start for them in this game. Portugal had an up and down experience during the group stage. They first played a thrilling 3-3 draw against Spain in matchday 1. It was one of the best games of the tournament thus far and include everything from a Nacho volley off the post and in, to a Ronaldo free kick capping off his hat trick. They got past Morocco with an early goal but faced trouble in the final game against Iran. After Ricardo Quaresma scored a wonder goal which only he attempts, a shaky penalty call led to Iran getting a penalty kick, which they converted. It was nervy times for Portugal as another Iran goal would see them crashing out of the group stage. Hearts were in the throats of all those in the stadium when Iran had a one on one chance with Rui Patricio closing down. The shot flew past Patricio but it went on the wrong side of the post and Portugal survived. But if there was a saying that fits this team's will, it’s “survive and advance”. We saw how Portugal plays during the knockout rounds of Euro 2016. They are willing to make the game ugly and rely on random contributions from the “other guys” if Ronaldo doesn’t show up. Against a strong Uruguay backline, Ronaldo will be the center of attention and guys like Gonçalo Guedes will have to make smart runs into the open spaces vacated by Uruguay defenders. Portugal has shown at times that they can step up when Ronaldo can’t. This will come down to whose talisman are more lethal and can finish more chances. Uruguay has two world-class strikers in Cavani and Suarez but Portugal has a Ronaldo. It will be an all out war and it won’t be pretty, but aesthetic is what neither team is good at nor are they trying to achieve an eye appealing playing style, especially Uruguay. They play very similar to Atletico Madrid on a club level and have become a mainstay in world football by doing so. Prediction: What Uruguay is better than Portugal at is making this game murky and hard to watch. Uruguay wins in an absolute slugfest of a game. Suarez likely bags the winner.